Asus' mainstream models are labeled K-series. They are supposed to satisfy the average computer needs. Barely any connections, little performance and an average display? Read if we can recommend the 17 incher at hand. 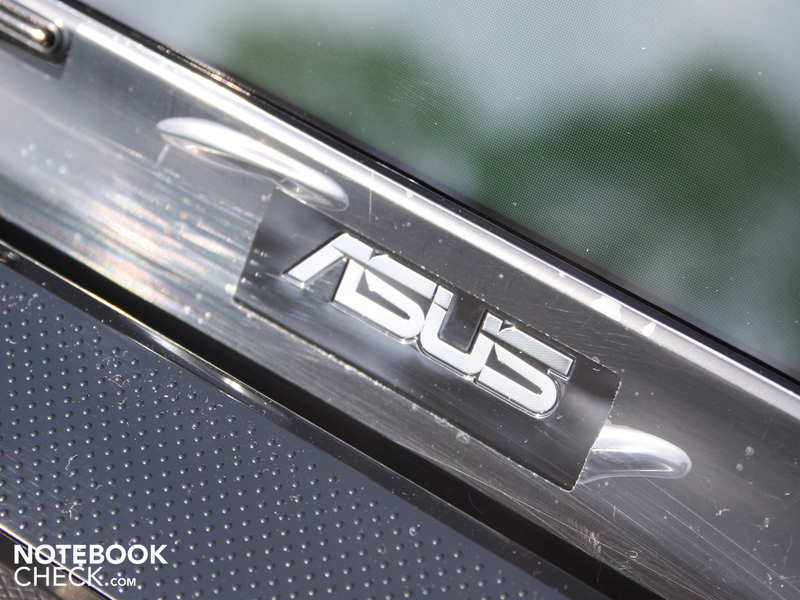 The Asus K72-J models, with the latest processors, are replacing the K70IJ series. 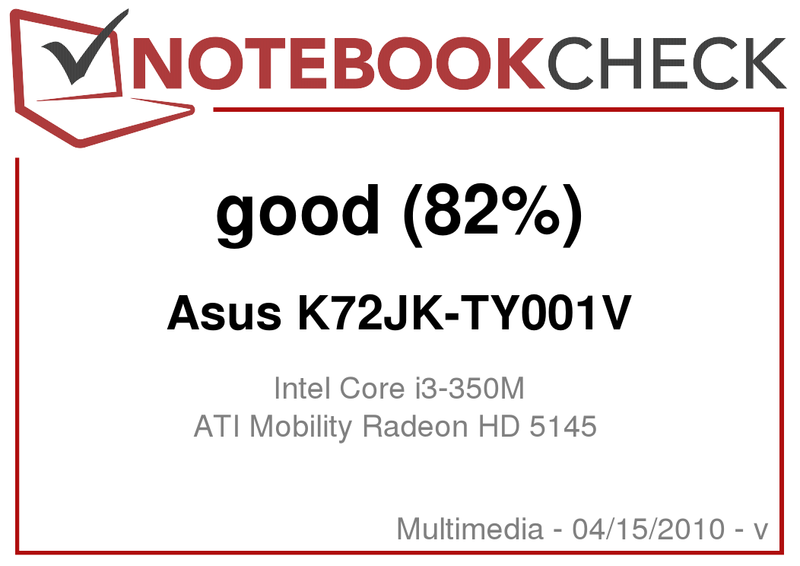 Because "K" indicates Asus' mainstream notebooks, starter processors of type Core i3 and a smaller dedicated graphic card, like the ATI HD 5145, will be used. This results in a 17.3 incher that should be satisfactory for the majority of computer users. If you're replacing your desktop PC with a notebook and want to waive on an external TFT display, 17 inchers will be interesting for you. They provide a compromise of portability and mobility, as well as a sufficiently well arranged resolution. 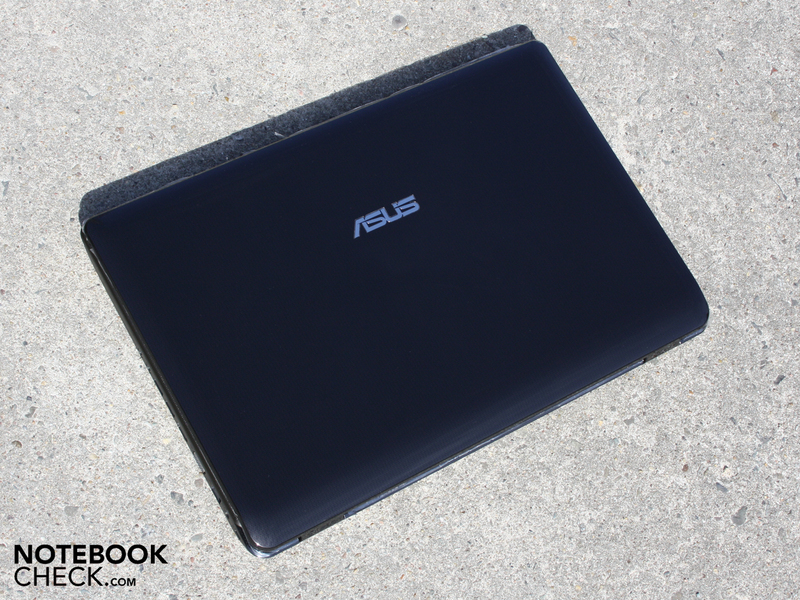 All others are aligned towards 15.6 inches and are encountered by Asus in the sister model K52JR, which we could also review. The K72JK's case reminds of Asus' K52JR-SX059V. The surface's feel, look and characteristics are the same. 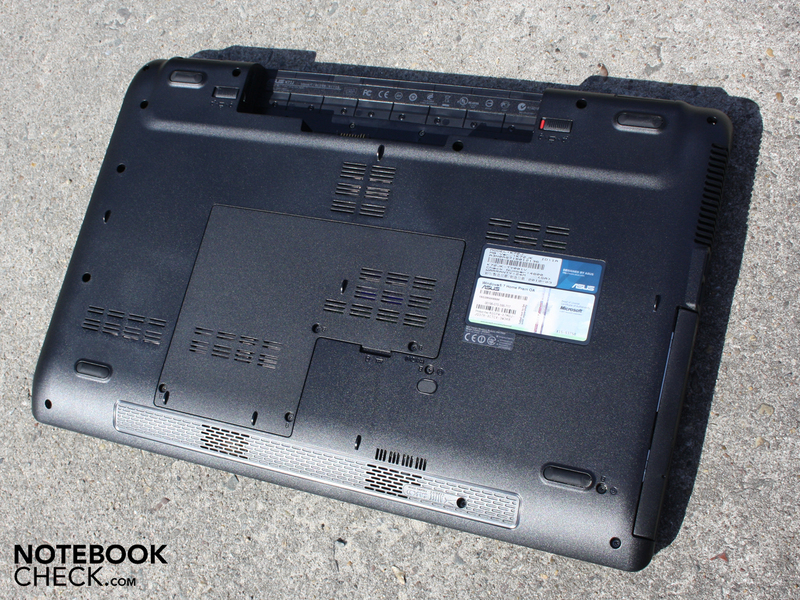 No wonder, as it ultimately is the K-Series, whereby the K72 represents the 17 inch form factor. 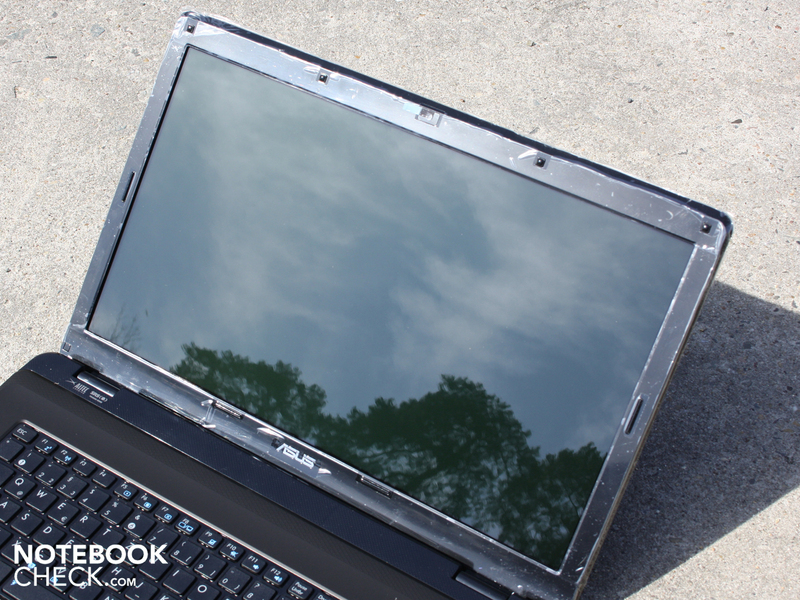 The notebook hasn't been optimized for office use, which can doubtlessly be recognized in the reflective display and under average keyboard. Nevertheless, the work area's surface is pleasantly striking. The wrist-rest's grain is a bit slippery, but fingerprints don't remain, anyway. The grain provides a certain grip, which we don't want to overstate here. The surfaces still have a smooth feel. 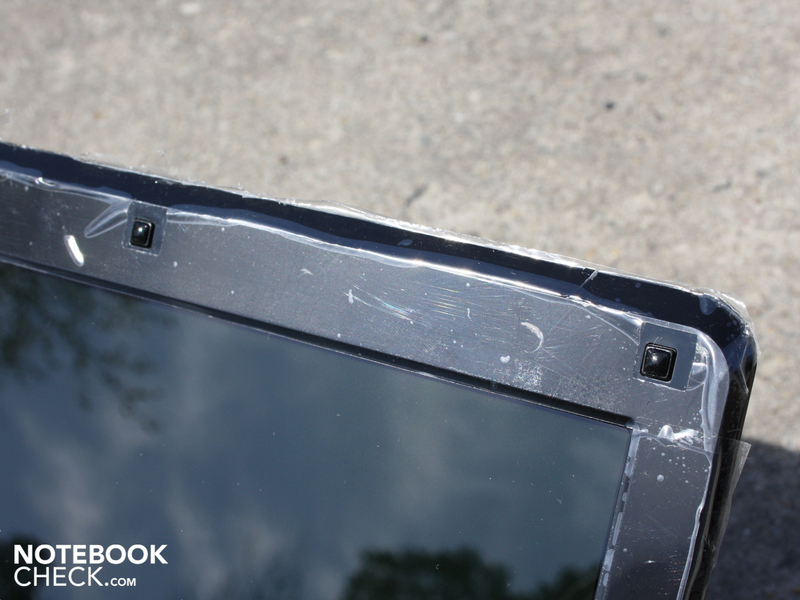 However, Asus doesn't forgo on high-gloss. Thus, the black-brown lid diligently collects fingerprints and copycats the glossy black display bezel. These surfaces are covered with a foil to protect them against scratches in state of delivery. 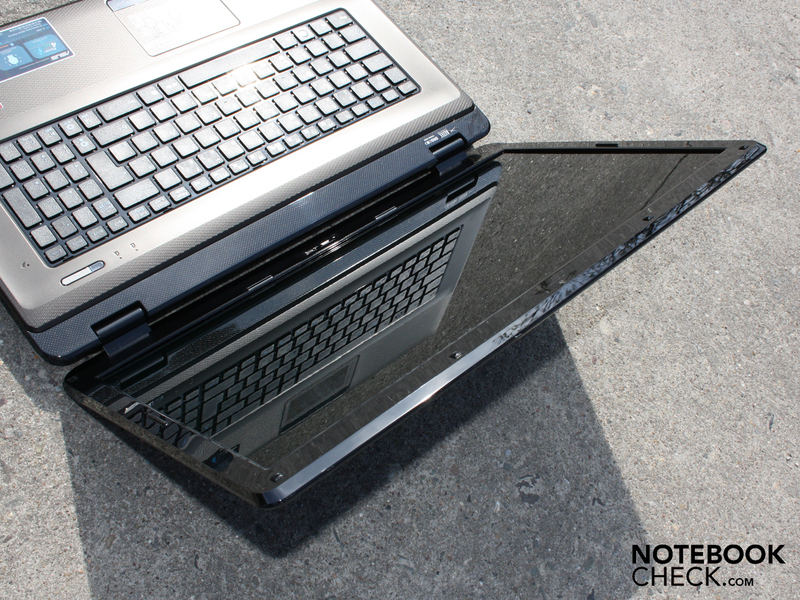 Everyone can imagine how long these surfaces will remain so nicely unscratched when the laptop is treated carelessly. The glare-type display fits perfectly in this alignment. The case is more stable than you would expect of a mainstream range. It's as stiff as a board in handling and the case makes a high-end impression with its even gaps. We almost can't twist the case with both hands. The wrist-rest is tight, just like the base plate. The key area needs to be reprimanded, as it obviously dents on the left side. Just like the lid. We can twist these visibly without much force, whereas it is accompanied by an audible creaking during this movement. The lid's area can barely ward off dents. The hinges keep the heavy lid tight in place, but tend to teeter obviously. The user needs both hands to open the lid. The lid's hinges sit tight in their latch. The maximum opening angle is more than sufficient for a use on the lap (circa 125 degrees). The base plate presents simple plastic and can only be dent on the bigger fan vents easily with a finger. 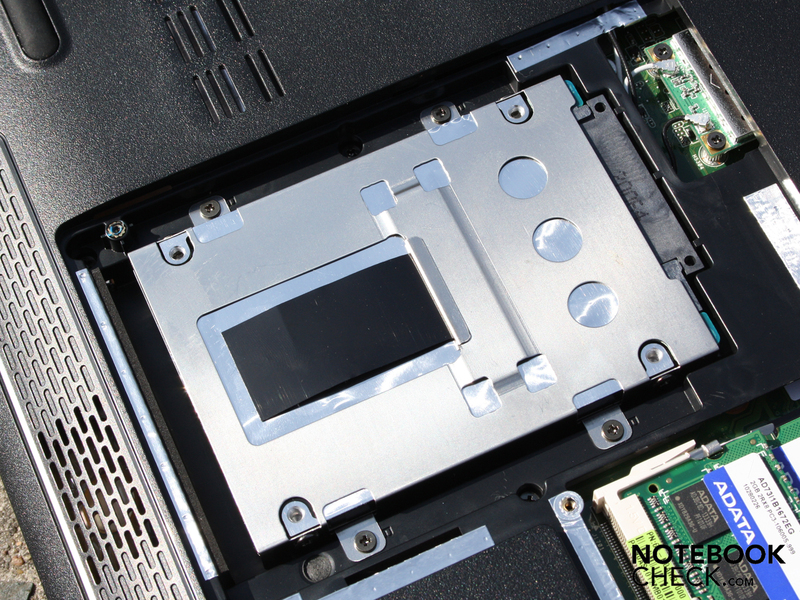 The big opening on the bottom allows you to exchange the hard disk, RAM or WLAN module. 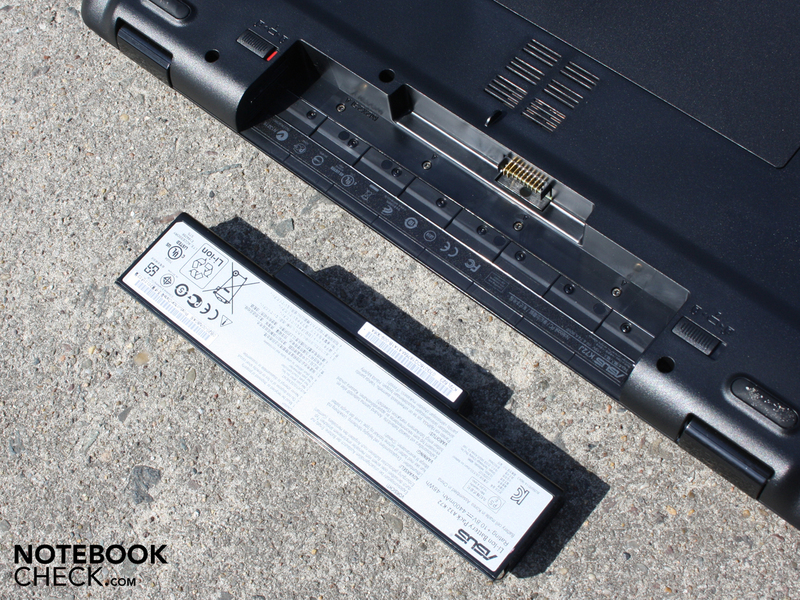 The battery can be removed for using the 17.3 incher permanently on the desk. An empty space in the work environment isn't created. Overall, the combination of a grained surface and the colors, black and dark brown, give the 17.3 incher a mature look. The high-quality experience meets its limits on the lid and the keyboard at handling, though. 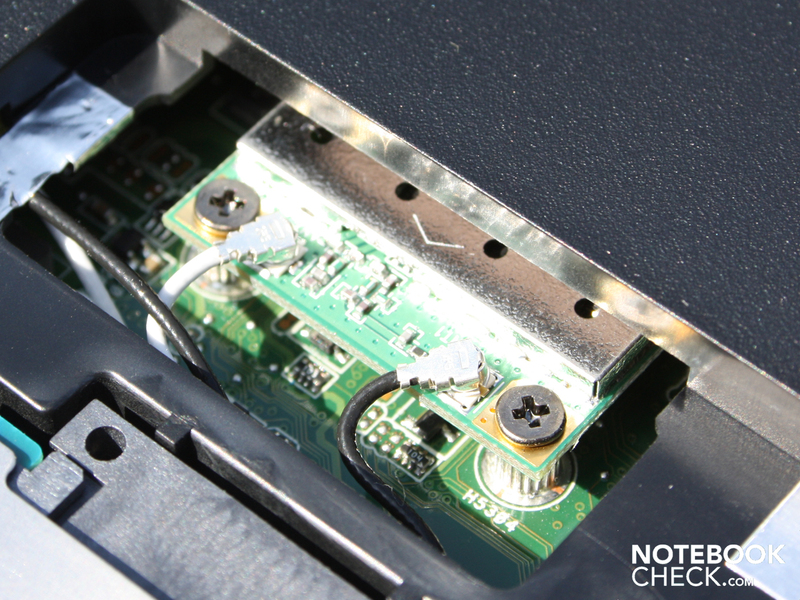 The Asus K572JK merely provides a limited amount of connections for linking a mouse, printer, TFT or other peripherals. The K72JK doesn't have eSATA, a display port or FireWire. At least there is a HDMI port on the case's right. Users can also connect their monitor over an analog VGA interface. There are four USB ports, two on the left and two on the right. We quite liked the interface distribution. As more often than not, the rear isn't used for ports, but at least the lateral interfaces are all placed in the back area. 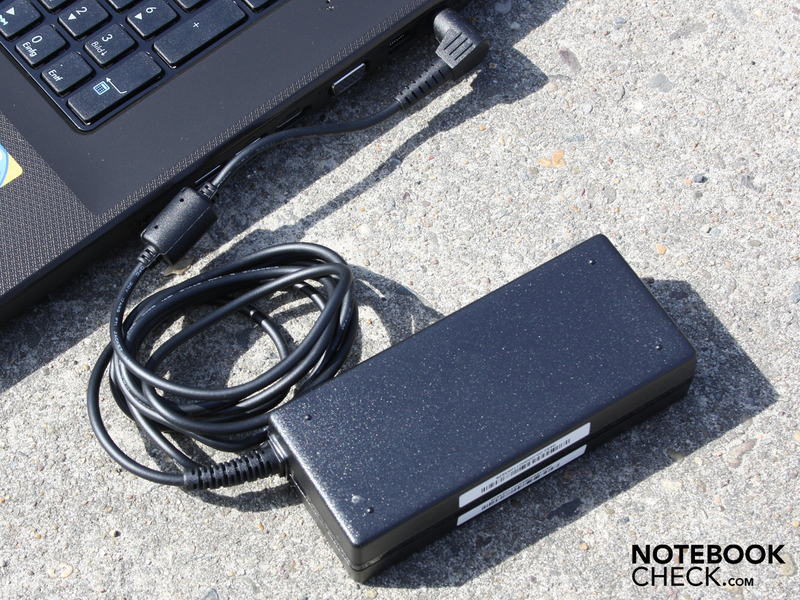 Thus, users can use a mouse on the notebook's right or left without getting tangled up in a cable harness. Both left USB ports are too close to each other, in any case. Broad USB sticks or curved plugs will interfere with each other. 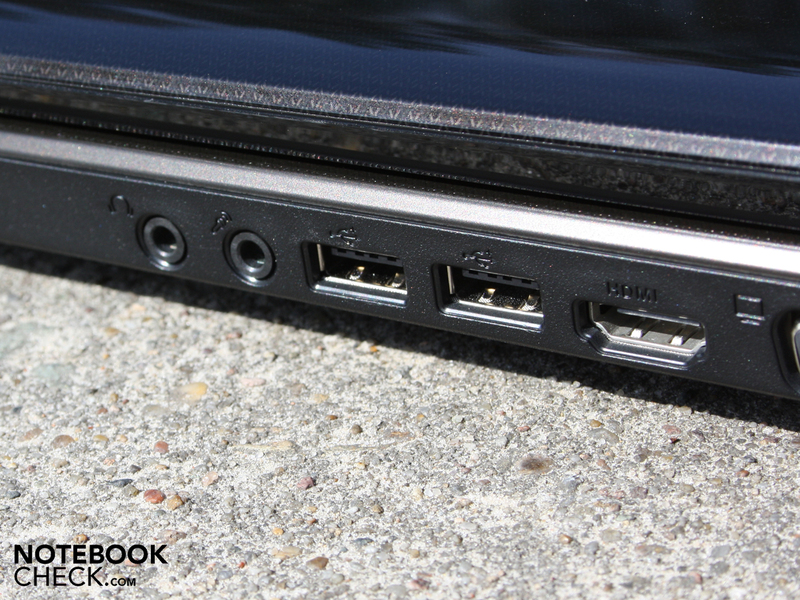 In our opinion, the HDMI and VGA port positioning (right) are sensible. Your bulky cables will therefore be placed in the base unit's rear. The Atheros AR9285 wireless card supports WLAN in the fastest draft-n standard. 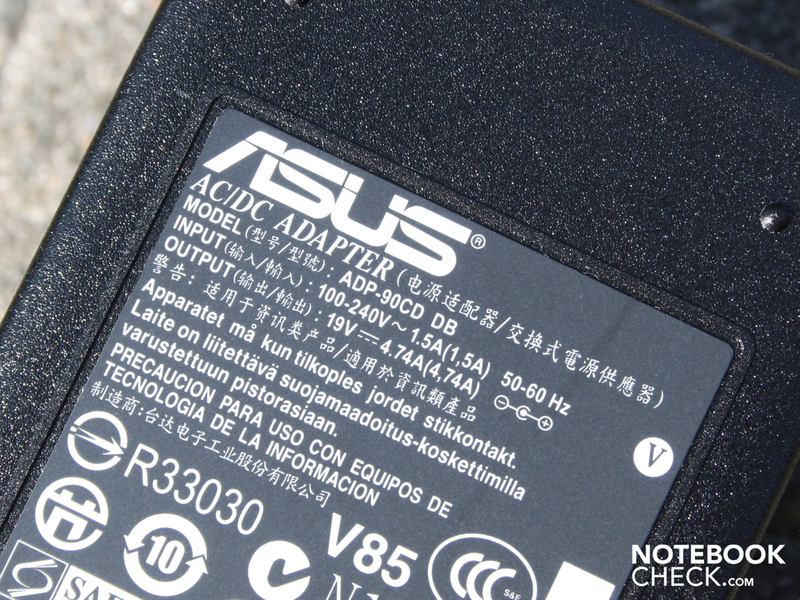 Asus has forgone on a Bluetooth module in exchange. If you want to connect the 17.3 incher with the gigabit switch and router, you'll find a suitable Ethernet card in the Atheros AR8131 PCI-E Gigabit Ethernet controller. Data, movies and music can be quickly moved from and to the home network group with it. 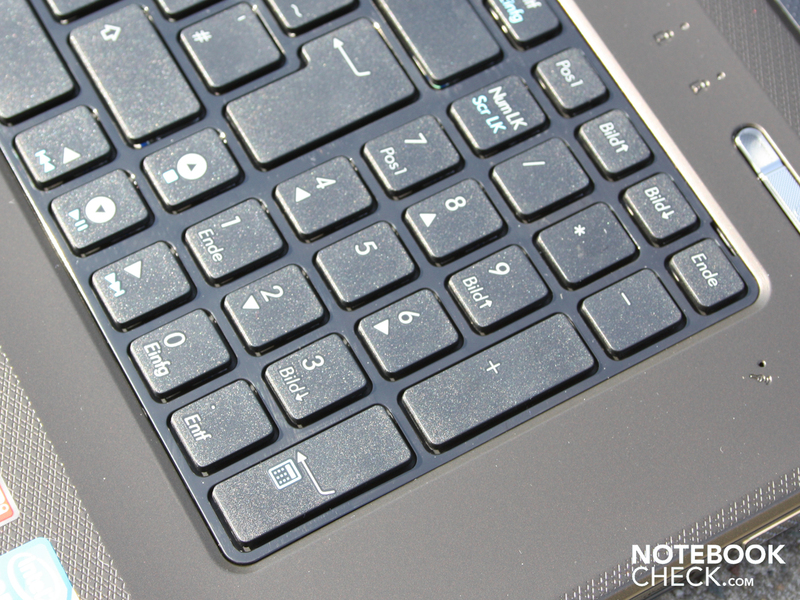 Asus uses, as in almost all of its devices, a chiclet keyboard. The keys are very visibly separated by a crosspiece. The layout is, except for the squeezed in arrow keys, auspicious and we can even feel the marking for touch-typists easily. The keys provide the typist with a distinct pressure point and a long key stroke. However, the vague stroke is a problem. It's caused by a more or less resilient keyboard surface. A light keystroke is enough to make a bending of the key field visible. The only solid sitting area of the keyboard is the number pad. The mouse substitute is worked into the wrist-rest and marked by a slight indentation. 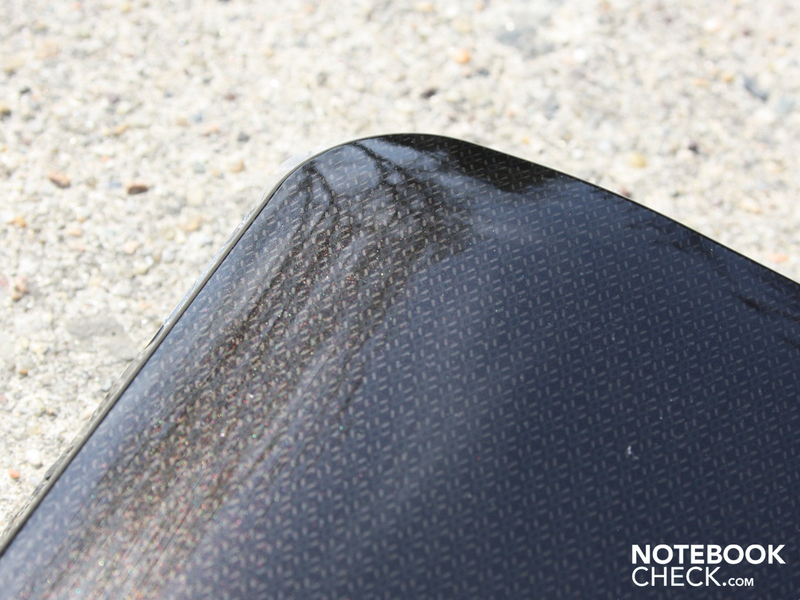 The feel of this surface is equal to the wrist-rest's characteristics. The finger moves on an accurate but (for our taste) too smooth surface. 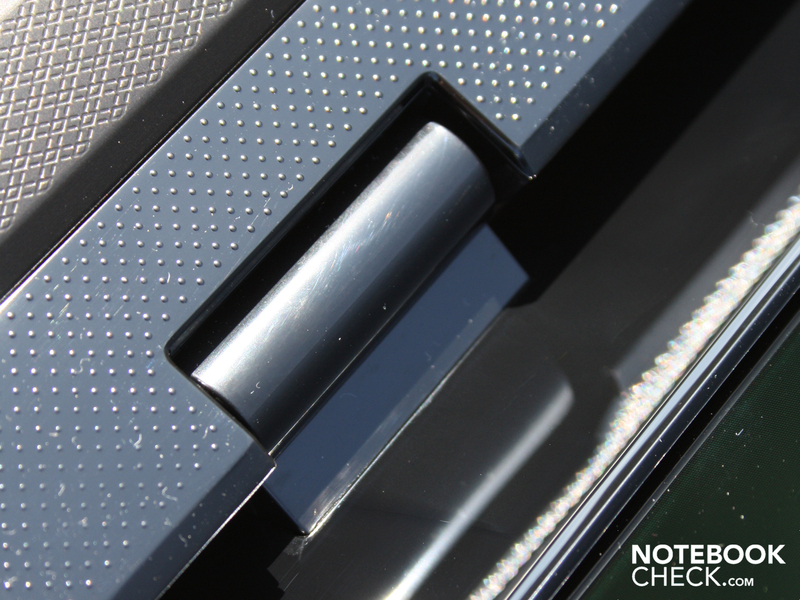 The touchpad's surface appears to be very big, but a fingerbreadth of the edges isn't touch-sensitive. The touch-surface doesn't have a vertical or horizontal scroll bar. 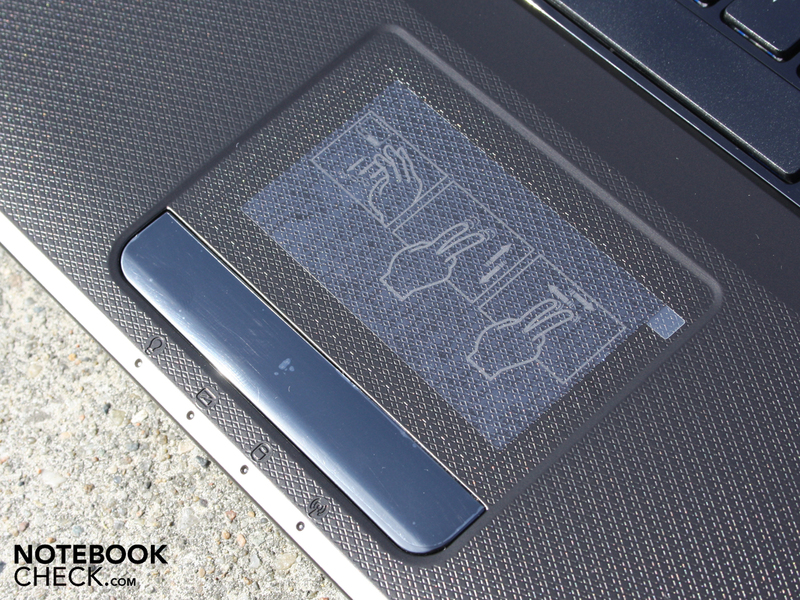 The probable reason: This isn't any longer necessary because of the Elan Smart-Pad's gesture recognition. Users can scroll vertically and horizontally with two fingers. One flaw: Classical gestures, such as spreading two fingers for zooming, aren't possible. The keys click loudly, clatter and require a fairly high pressure point. They make a low-end impression because of this. Asus hasn't set very high standards for the keyboard and touchpad. This doesn't change for the display, either. 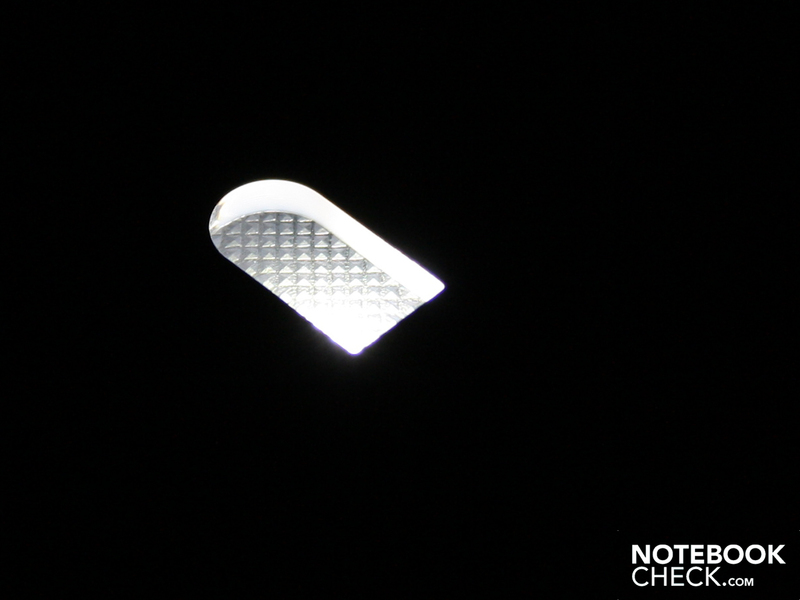 The reflective LG screen (type LP173WD1-TLC1) has a resolution of 1600x900 pixels. This WXGA++ resolution is, so to say, the minimum standard for a 17.3 incher. Most users will be content with the fairly coarse resolution, especially as almost all applications are infinitely scalable nowadays (office programs, web browsers, Outlook). The LG screen has its weakness in the low contrast of 208:1. This low rate is typical for office notebooks, as well as for inexpensive all rounders. Buyers with a high demand on brilliant colors should look around for an alternative. The glare-type display improves the low contrast visibly, but it's only an optical illusion. The display has been set up too weak for a multimedia notebook. Better contrasts would have been advantageous for movies, pictures and games, at any rate. The narrow color space shows that the K72JK has missed this goal by lengths. 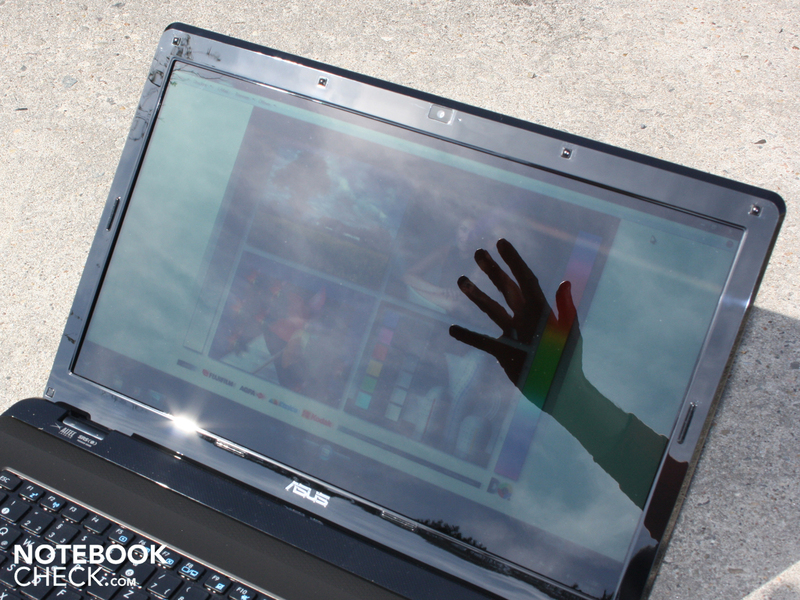 The 17.3 inch display's LED backlight brightens the screen up to an average of 190 cd/m2. This is sufficient for interiors, but it'll get difficult in sunlight. The illumination is very homogeneous, on a low level. The brightest and darkest areas only have a difference of about 10 cd/m2. Thus, the illumination is a very good 95 percent. You'll have bad luck with the prototype if you like going outside with your 17 incher. The screen hasn't been AR-coated (glare-type) and reflects. The low luminosity of 190 cd/m2 can't do much about the reflections, either. The user barely has a chance on adequate visibility with the K72JK, especially in direct sunlight. Corresponding to the difficult to clean high-gloss surfaces and the weight of 3168 grams plus the 463 gram adapter, the use as a mobile companion will clearly step into the background. 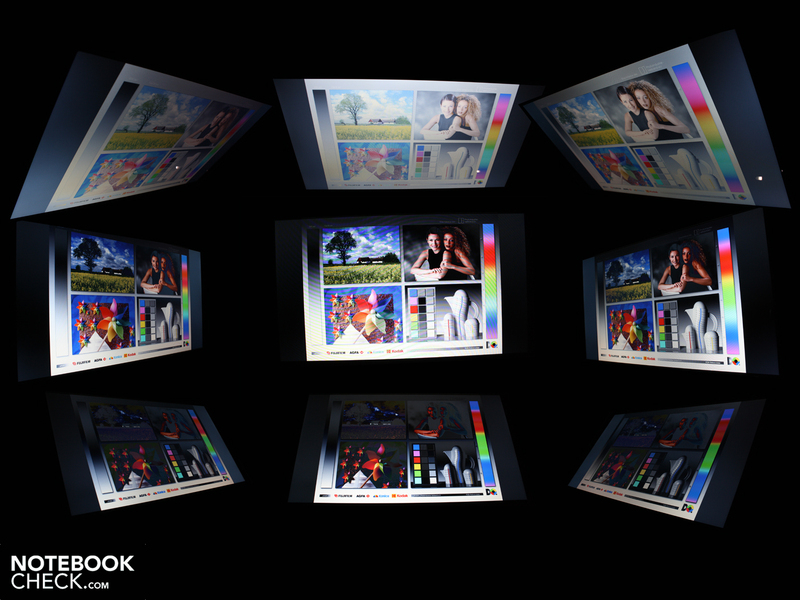 A notebook TFT needs good viewing angles so that the viewer can recognize colors and writing from above and below at a constant brightness. This demand is mandatory for multimedia notebooks. Reason: Frequently, many observers gather around the display during gaming or watching a movie. The viewing angles are, however, equally poor. Our view could deviate up to 40 degrees on the horizontal plane before the display dimmed and the colors were falsified. This effect already begins at the slightest deviation from the front position. The image then dims considerably and the colors bleach (invert). 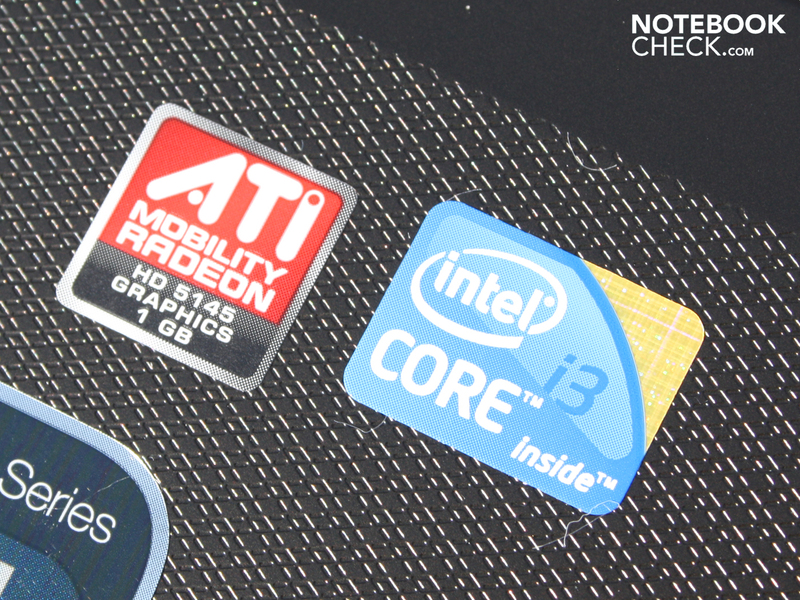 Intel's new mobile processors, Core i3, i5 and i7, are on the wish lists of notebook buyers. Unsurprisingly, as the new CPUs can scale the performance much better, and thus only use a lot of energy when the program calls for it. A Core i3-350M CPU (2.26 GHz) does its work in the K72JK. Aside from the i3-330M, it's the smallest processor from Intel's newest Arrandale range. These CPUs are produced in a cutting edge manufacturing process, which is 32nm. The processor has a 3MB L2 cache (Intel Smart Cache) and a clock rate of 2.26 GHz. The i3-350M thus has a low clock rate, but in return, has hyperthreading (HT). All Core ix-es have this technology in common. It makes sure that every physical core is supported by a virtual core. Therefore, the native quad-core, Core i7, can compute with a total of 8 threads, the i5 with four and the i3, also with four. The operating system, in particular, can benefit from managing tasks at the same time. Where's the difference to a Core i5/i7? Core i3 doesn't have turbo boost. This function allows the cores to overclock dynamically depending on the application's requirement. Single-core applications thus also receive the best performance, like multi-core applications do. Turbo boost is a big advantage for professional users and gamers because every application type is accelerated. The Core i3-350M is supported by a four gigabyte DDR3 SDRAM. This lot sits on two modules and has established itself as standard for Windows 7 systems (here 64 bits) in this price class. The Core i3-350M (2.26 GHz) clearly lines up behind its sister models, i5-520M and i5-430M. Cinebench R11.5's (64 bit) processor-only test always awards the 520M laptop with 2.1 and 2.2 points and marks 430M CPUs with 2.0. The employed 350M scores measurably worse with 1.8 points here. The reason for that is the non-existent turbo boost in the i3. It's because of hyper threading that the difference isn't any bigger despite the lower clock rate. Both Core i3 and i5 can compute with four threads, even if they are native dual-cores. The 2.26 GHz of the i3-320M is inferior to the identically clocked i5-430M in single-core computation, due to it lacking turbo boost. The latter achieves up to 3362 points (Cinebench R10 Single-Core Rendering 64 bit, Sony Vaio VPC-EB1S1E/BJ). The 350M achieves 2920 points. The Core i3-350M is a starter in terms of performance, with which users can manage multitasking applications without delays in the coming years. Users set on performance are better advised with a turbo boost capable i5 processor, though. PCMark Vantage determined a system performance of 5296 points. 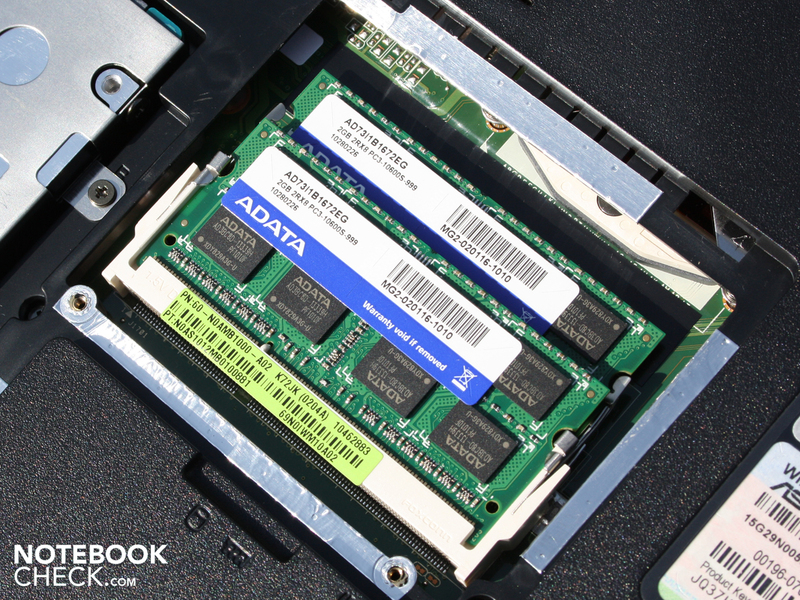 All components, from the processor up to the RAM and hard disk, are checked in this test. PCMark Vantage's graph shows: The Asus K72JK bids a better application rate than a Sony Vaio VGN-FW51MF (4096) or an Acer Aspire 5935G (3882) with fast Core 2 Duo CPUs (T9550). Due to the progress of hyper threading in Core i3, the starter processors have to have a higher performance than the premium models of mid 2009. A higher clocked Core 2 Duo might be better than the i3 in the odd case, but PCMark Vantange doesn't attach much importance to that. The Asus K72JK has a fast 5400 rpm hard disk from Seagate onboard. The 500 GB HDD (ST9500325AS) reads data from the disk at 64.5 MB/s in sequential read. That's an average rate in comparison. But it contributes to the good system performance, as it's reflected in PCMark Vantage. The HDD can only be heard by a quiet clicking. The ATI Mobility Radeon HD 5145 graphic card has access to a 1024 MB GDDR3 video memory and belongs to the starter class. The memory has a clock rate of 750 MHz. The GPU is only capable of DirectX 10.1 because, despite the "5" in its name, it is a renamed Mobility Radeon HD 4570 with a slightly higher clock rate. The latter statement isn't even completely true. Asus only runs the video memory with 750 MHz and doesn't utilize the possible 900 MHz. Even the 4570 could clock with 800 MHz, depending on the manufacturer. The gaming performance will turn out considerably lower in comparison to an ATI HD 5650 or Nvidia GT 330M. However, they are usually sufficient to present current games smoothly. But the user shouldn't reckon with high or medium detail levels / resolutions. 3DMark06 indicates the low gaming performance with a weak 3655 points. This older 3D test doesn't show us the i3-350M + HD 5145 combination's real gaming performance, though. Therefore, we've executed a few gaming tests. The ego shooter doesn't run smoothly in 1024x768 pixels and high details with 23 fps any longer. Thus, the HD 5145 is on the low level of a HD 5470 (real DirectX 11 GPU). The difference of 43 fps to the HD 5650 is extremely large. In order to achieve this frame rate, the HD 5650 doesn't even need a strong processor. See Acer's Aspire 8942G-334G64Mn (i3-330M). FarCry 2 needs a strong GPU. Toshiba's Satellite L550-207 with a weaker Intel i3-330M but HD 5165 reaches a very good frame rate of 44 fps (high settings). Infinity Ward's shooter doesn't belong to one of the most demanding games. A smooth 61 fps is possible in low details and a resolution of 800x600 (0xAA). Unfortunately, the game doesn't look particularly good any more. So, a quick adjustment to medium settings (1024x768, 2xAA, medium details). Now the frames break in drastically and are 25 fps on average. The game stutters in action-packed sequences. If you select a mix of low and medium details and disable AA, you can experience a fairly smooth game (around 30 fps). 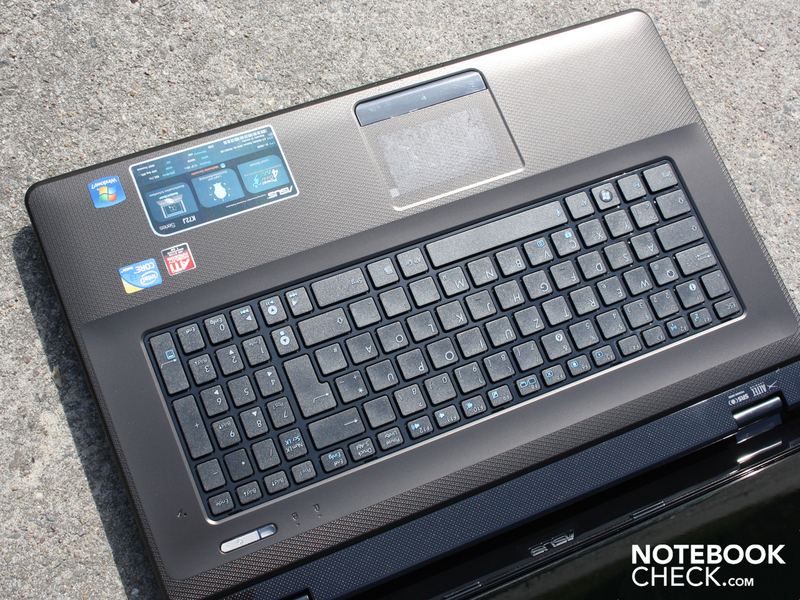 This performance is on par with a HD 5470, which we tested in Acer's Aspire 5741G-334G50Mn. If that's still not enough, you should look around for a HD 5650. This GPU achieves a good 38 fps in high details/resolutions (1366x768). Notebooks with this GPU, such as Dell's Studio 1749 or Packard Bell's Easynote TJ75-JO-070GE, are available for a bit more money or partly even cheaper. The HD 5145 can only manage the fantasy adventure, Risen, in low settings. Gaming fun just doesn't want to turn up because of the unpleasant graphics in 800x600 pixels and low details (38.5 fps). Asus' K72JK only reaches 25 fps in Risen's medium settings (1024x768, medium, 2xAF). The adventure is very well still playable with that. The HD 5650 (Dell Studio 1749), however, already achieves 44 fps in the same settings (medium) and thus allows ambitions for higher details. The HD 5145 is overtaxed with F.E.A.R. 2. The horror shooter can not be played smoothly in a high resolution (1280x1024) and high details (high, 4xAA) any longer. Gamers have to reset to 1024x868 pixels and medium details in order to achieve 34 fps. Even competitor laptops with a midrange GPU exceed the K72 all rounder by lengths. A GeForce GT 335 achieves 40 fps (Asus N82JV), a HD 5650 42 fps (Acer Aspire 8942G-334G64Mn) and an older HD 4650 even 53 fps (Samsung R522). Crysis is everything but playable in high details and a medium resolution (1024x768) with around 13 fps. The shooter doesn't benefit from the Core i3's hyperthreading. Even a Core 2 Duo T6400 (2.2 GHz), as in Samsung's R522 (HD 4650), achieves 28 fps. Crysis is first playable in the same resolution with low details: 66 fps (GPU benchmark). 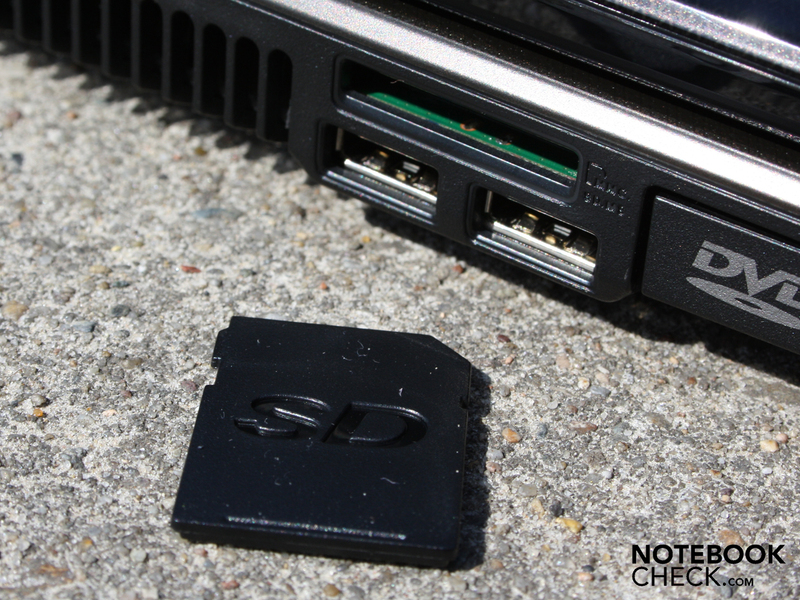 The gaming tests show the expected: There wasn't much to get out of the ATI HD 5145. Current and in particular demanding games shouldn't end up on the hard disk. The performance will be sufficient for older games, a la Left4Dead, in medium settings. Potential buyers can refer to the ATI HD 4570 and its measured rates in our graphic card comparison. The built in HD 5145 is, in fact, a renamed Mobility Radeon HD 4570. We opted for the Power4Gear mode Quiet Office for measuring the system noise. It doesn't have an impact on the speed in idle - it stays the same in every mode. We determined an audible 32 dB(A). The fan runs continuously in these low speed levels during surfing or writing emails. These range from 32 to 32.5 dB(A) at most and are therefore principally not disturbing. However, the active cooling never shuts off, not even in battery mode. The fan turns up to 35.3 dB(A) during gaming or constant processor load induced by a CPU benchmark. The Asus K72JK's fan remains consistent in its selected speed. We coaxed the fan into turning up to a maximum of 40 dB(A) first with a stress test. The cooling still even stayed constant here. If you now start the Quiet Office mode (Fn + space), you can successfully turn down the noise intensity under load. However, it takes its toll on performance. The CPU only clocks with 958 MHz then. Merely the ATI GPU doesn't limit the clock rate and runs its 720/750 MHz (core/memory) to the full. 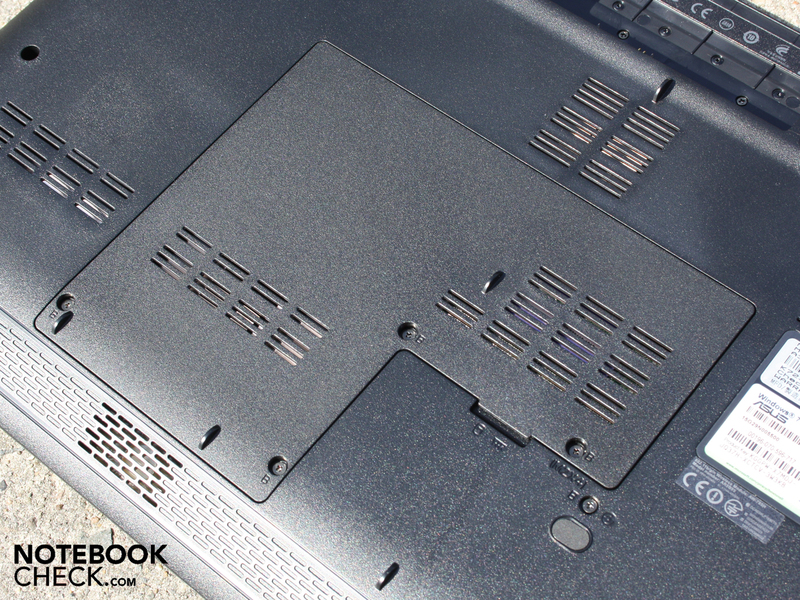 K-Series laptops have had one thing in common until recently. The base unit's so-called IceCool design. This implies a cooling construction that has a fairly high capacity (large spacial requirements) but keep the wrist-rest and keyboard very cool. The manufacturer doesn't tout this feature any longer for the K72JK model, but the positive effects are almost the same. The average temperature on the bottom was 26 degrees in a scenario of surfing and word processing, so almost idle. The wrist-rest area stays pleasantly cool with 23 to 25 degrees. We've recorded the waste heat under stress in high performance mode. The fan runs on its highest level in the stress test and dissipates a lot of waste heat out of the case. The evaluation determined an average of merely 31 degrees Celcius on the upper side under high load. Heat can also be felt only in the vent's immediate area on the bottom. It gets extremely warm with 50.3 degrees Celcius there. The other areas stay considerably cooler with 24 to 32 degrees. The K72JK survived the stress test without taking damage. It didn't crash like we experienced it in its sister model K52JR. Enabling the Quiet Office mode in the stress scenario didn't make the GPU heat up to much (72 degrees Celcius maximum) so that it doesn't come to a forced shutdown. The K52JR had this problem. The CPU clocked the i3-350M down to 958 MHz in Quiet Office mode and thus lets the fan turn a bit slower and quieter. (±) The average temperature of the palmrest area of similar devices was 29.1 °C / 84.4 F (-0.1 °C / -0.2 F). 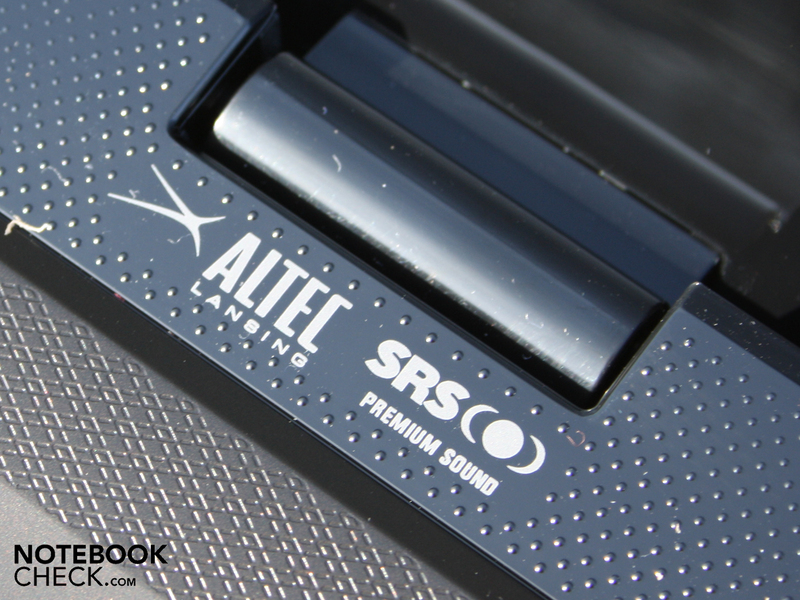 The Altec Lansing loudspeakers are found on the notebook's front under the wrist-rest. Although the practically emit towards the table, their sound is balanced and even a bit of bass feel turns up. 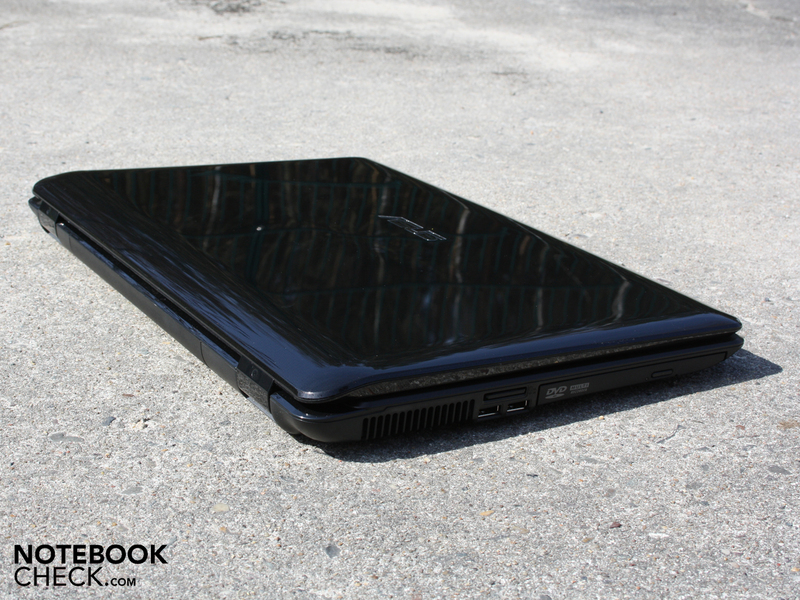 So, the K72JK fulfills our expectations in a multimedia notebook in terms of acoustics quite adequately. Even without a subwoofer. The sound is stable in high volumes, the membranes don't contort. The bass amplifier in the sound options should be enabled. Many notebook users connect an external loudspeaker to the 3.5 mm socket. We've tested that with two Yamaha speakers (YST-M20SDP). 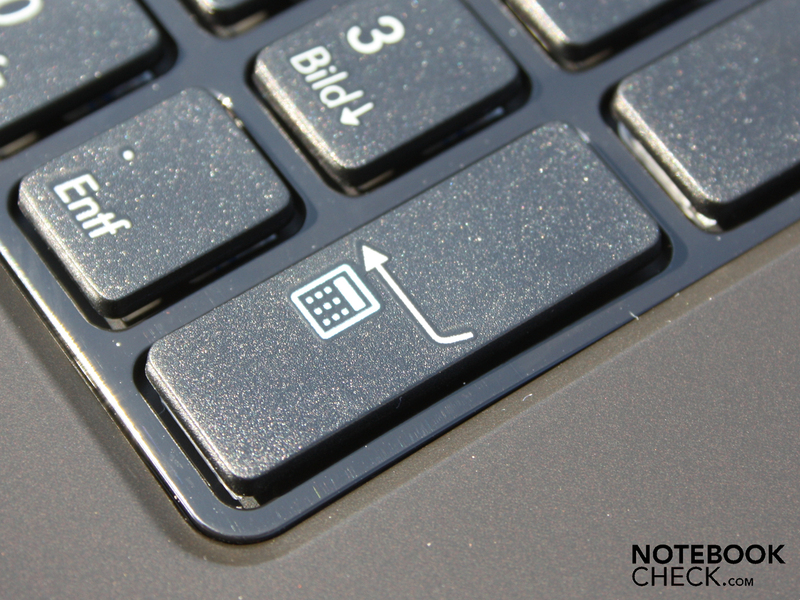 The notebook's tethered volume can be lowered as desired. A hissing of the external loudspeakers doesn't turn up with the integrated sound card even in low output levels. The volume level tethered to the sound card can be set very high. A 17 inch all rounder is certainly not made for ultimate mobility. Especially, as there is a too dim and reflective TFT display, which develops annoying reflections in sunlight in the case of the K72JK. 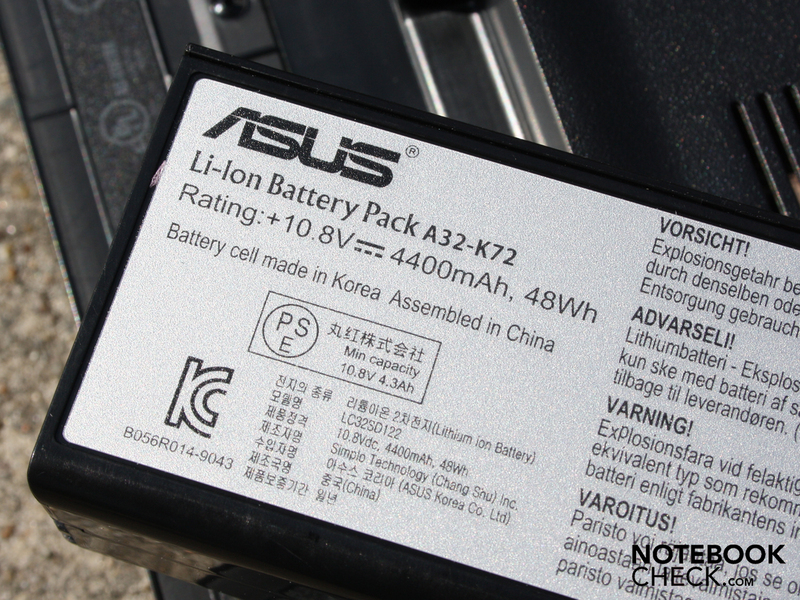 The Asus K72JK's battery life is 3:31 hours (211 minutes) in a continuous internet surfing session with enabled WLAN. If you're frugal and only edit Word documents, you can definitely reach a bit more than four hours with maximum energy savings options. BatteryEater Reader's test indicates 263 minutes (4:23 hours) as the maximum runtime. How long does a DVD movie run? The test established only 116 minutes. The 4400 mAh battery is ready for the next movie session after almost two hours. The battery needs 1:56 hours for recharging after a complete discharging. 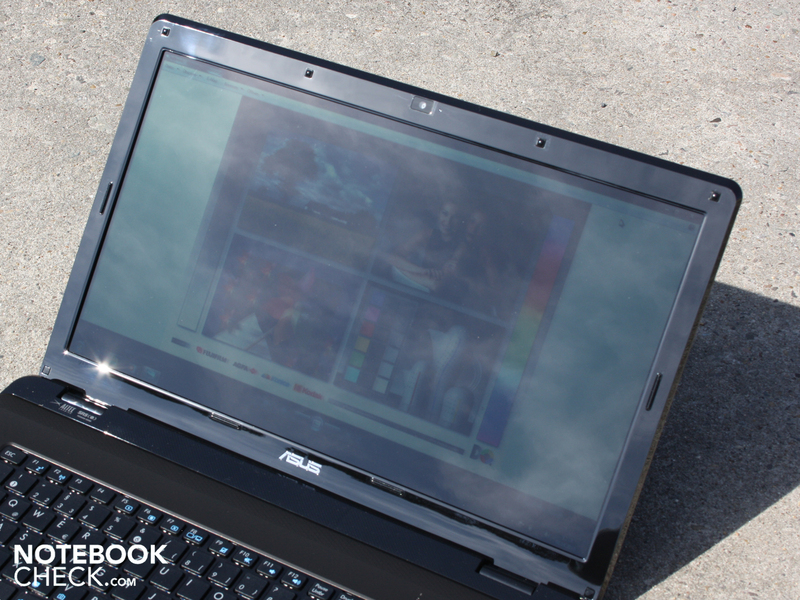 The all rounder is the right laptop for smart savers. Even if the notebook isn't for free, then at least the energy. Almost, anyway. When all possible energy savings options are exhausted, including Quiet Office mode, the idle power consumption is 11.5 watts. That is an undreamt of energy requirement for a 17 inch size with a standard processor and dedicated graphics. We can only find two 17 inchers (Dell Inspiron 1750, Asus N71JV) in our database that need equally little energy in idle. Admittedly, potential buyers should assume an average of 19 watts without load, seen realistically. But that is still very little. 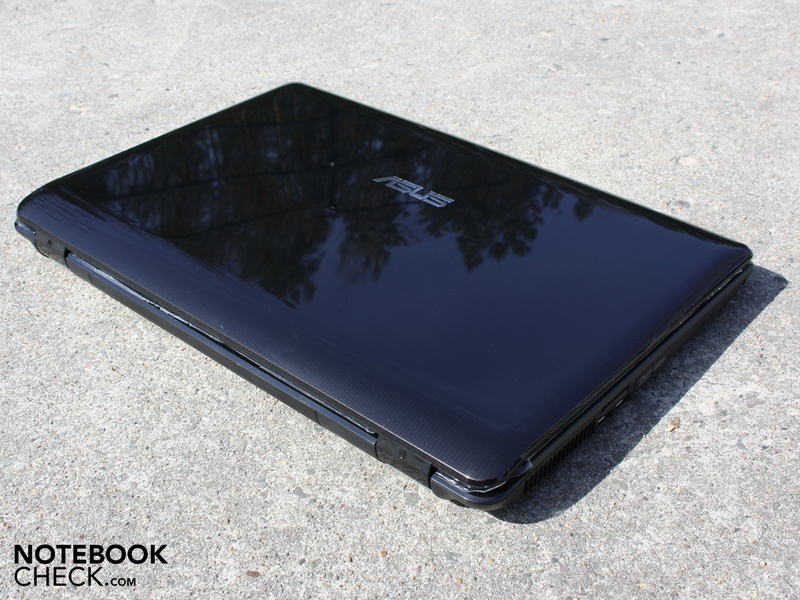 However, smart savers shouldn't leave their Asus K72JK in standby mode (Windows energy savings) for weeks on end. The 17.3 incher then still treats itself to 1.2 watts. When it's turned off properly it's still 0.3 watts, which is run through the adapter's coils. If the graphic card is engaged in a computer game, the effective power increases to 52 watts (3DMark2006). We've established the highest maximum, even if unrealistic power consumption, with a stress test (Prime95, Furmark). The multimeter indicates 72 watts. The 90 watt adapter is, in view of the maximum possible consumption, not overburdened. The Asus K72JK-TY001V with a Core i3-350M (2.26 GHz) is an average performing all rounder, which is suitable for fairly undemanding users in home use. The i3 processor is below that of its i5 sister models in terms of performance. However, multi-core applications can benefit from up to four possible threads even in the i3 (hyperthreading), in comparison to the prior Core 2 Duo generation. The midrange starter GPU, ATI Mobility Radeon HD 5145, can display the latest 3D games. However, strongly reduced details and resolutions are agenda. Serious gaming isn't possible with the K72JK. Ice Cool? 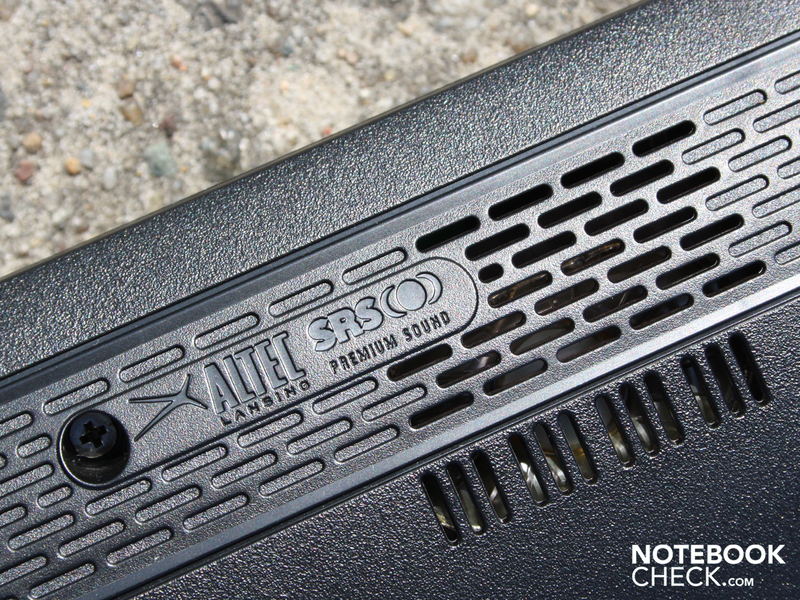 Asus doesn't adorn its K models with this label anymore, but the sophisticated cooling system has the case under control. The wrist-rest doesn't exceed 28 degrees (average) even in the stress test. The battery life is partly modest and partly quite good. Well three hours of surfing with WLAN, but only two hours of DVD rendering. A reflective, too dim and contrast poor display can be added. 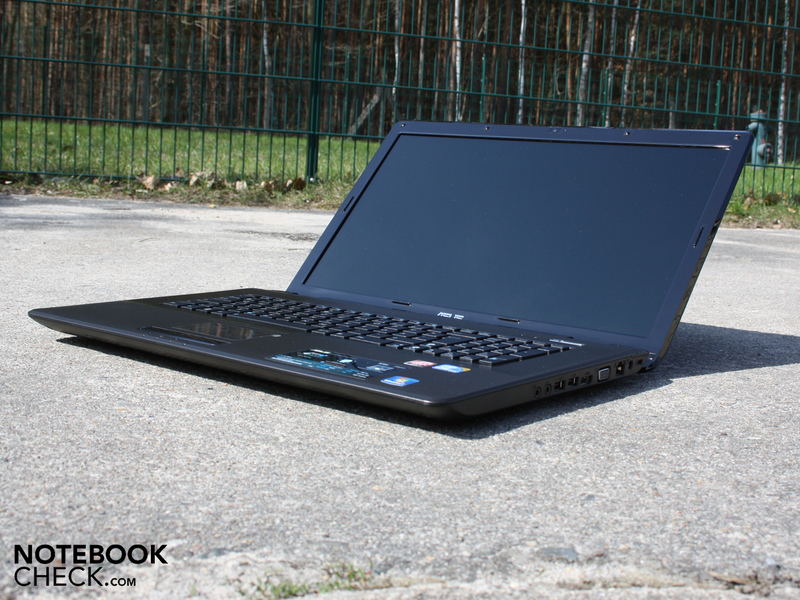 The K72JK can book a stable base unit, pleasant work surfaces and a silent mode, which really quiets the notebook down (CPU downclocking) on the pro side. Not to be disregarded is the top idle power consumption of 11 to 18 watts. Currently, there isn't a 17 incher that drains less out of the mains. 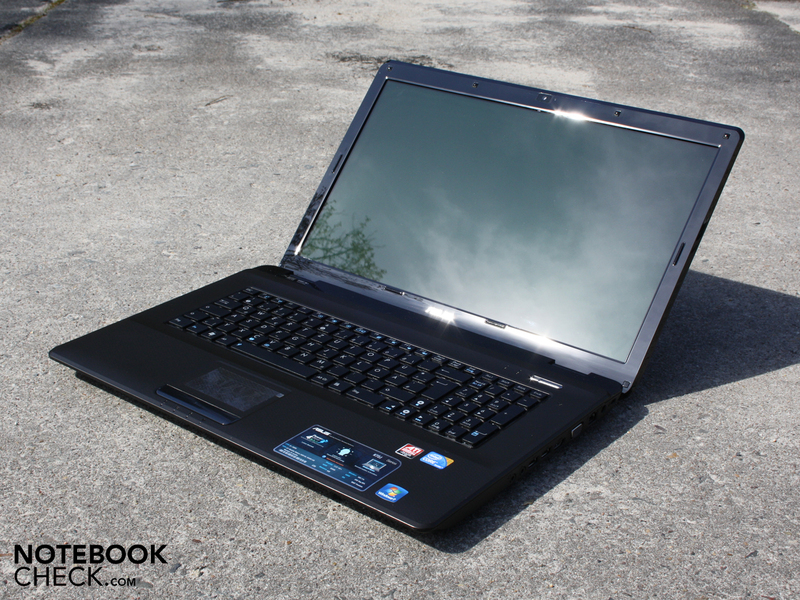 The Asus K72JK-TY001V is a 17.3 incher for around 750 euro. that the 4.400 mAh battery makes quite adequate runtimes possible, either. WLAN surfing ultimately comes to an end after three and a half hours and we need the adapter. It has 90 watts power, which is easily enough for the maximum power consumption of 72 watts. as well as the WLAN module (draft-n). for opposing the intense reflections. 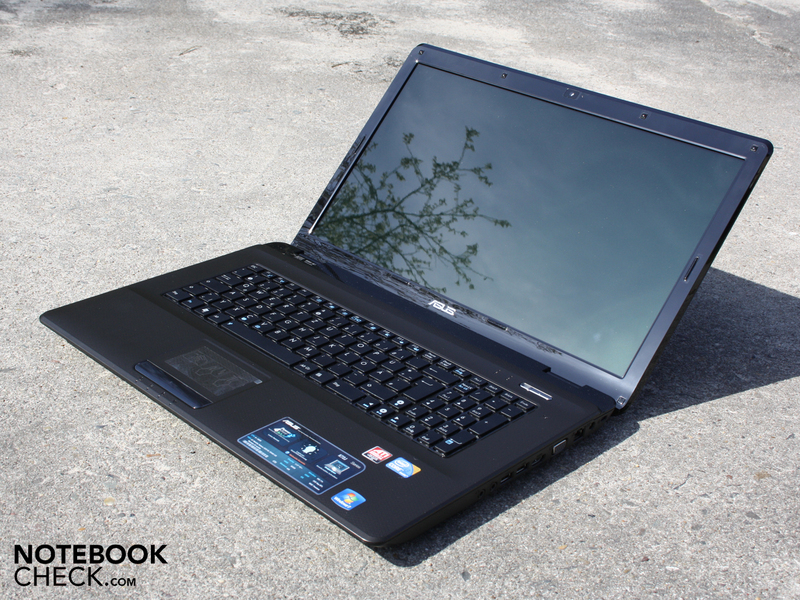 It is accompanied by Intel's Core i3-350M (2.26 GHz) and an ATI Mobility Radeon HD5145 at this price. The massive case turns out to be very quiet and cool. But it's as glossy as a greased pig from outside. on all high-gloss surfaces (state of delivery). 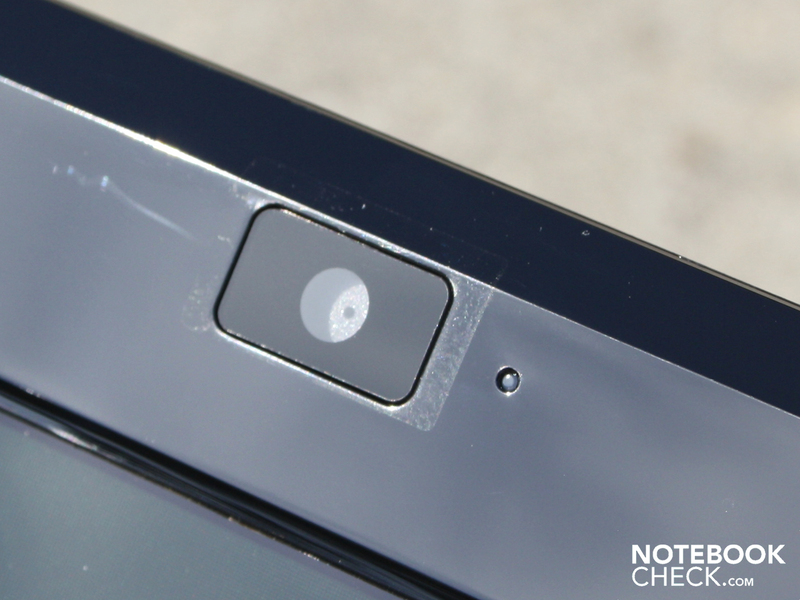 This applies, for example, to the display bezel (webcam). The Altec Lansing stereo speakers sound surprisingly good (no subwoofer). emits a white light in darkness. 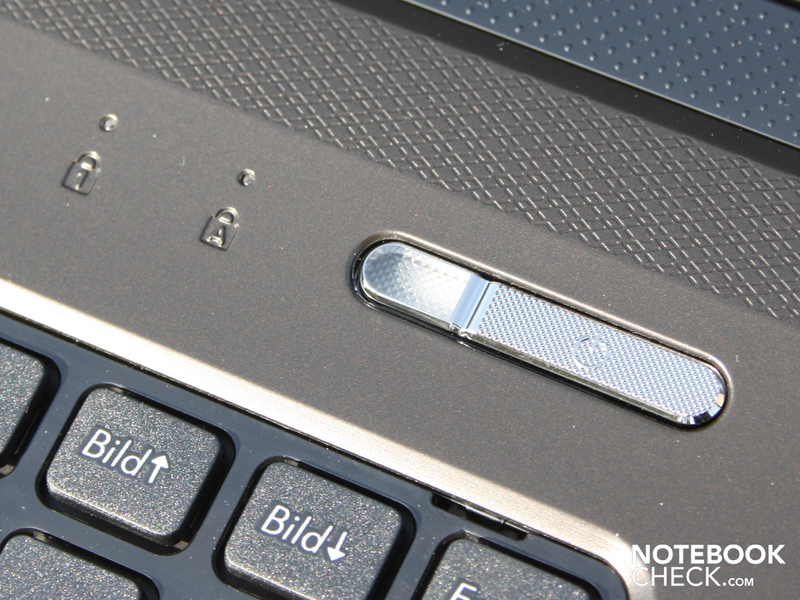 Asus K72JK-TY001V: Power button with lighting effect. + Good battery life for 17"
Stress test in Silent Mode: No more crashes! This was still the case in the 15.6 incher, K52JR. Extremely low power consumption in idle. The 17.3 incher could have gotten on the top list of energy savers with a good keyboard. But the statistic can't be taken care of with such a vague keyboard. The graphic card HD4570 has simply been renamed into HD5145. The lack of DirectX 11 can be cope with, but the memory's low clock rate is superfluous. Acer's Aspire 7740G: The 17.3 incher with a strong processor is looking for customers with a price of 700 euro. Acer's Aspire 8942G: It's even possible in 18.4 inch and with a stronger HD 5650. Price starts at 900 Euro. A lot more performance but "hotter" in all matters: Dell's Studio 1749 for 1000 euro.